When it comes to Extinguisher Maintenance – the importance cannot be stressed highly enough. During a recent visit to site by one of our extinguisher technicians he found the following on his inspection. Obviously in the case of an emergency situation these would not operate. This would put lives and property at risk. Did you know that it is a requirement to have your extinguishers serviced annually? 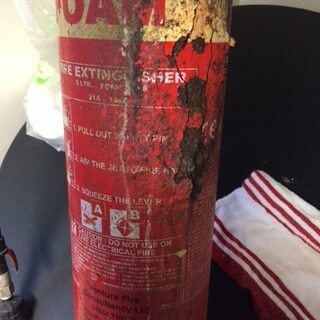 Do you have extinguishers on site do you know when where they last maintained? If not you will find the details recorded on a service label located on the extinguisher. If you require your extinguishers servicing please contact us on 0800 027 2480 for more information. We can provide quotation based on quantities without the need to attend site. In addition we supply and install new extinguishers should any fail the maintenance inspections. Let MJ Fire Safety give you peace of mind! This entry was posted in Building Safety, Fire, MJ Fire Safety, Our Blog, Protection. Bookmark the permalink.